Mission: "Transform civilians into motivated, disciplined warrior Airmen with the foundation to serve in the world's greatest Air Force." Vision: "Develop the next generation of Airmen who embody absolute professionalism." Air Force recruits undergo eight and a half weeks of training in San Antonio, Texas. Each week is scheduled, beginning with "week zero." This is the "processing week." New recruits get haircuts and are issued everything they need for basic training. That includes combat boots, running shoes, leather gloves, a duffel bag, wool and cotton socks, two towels, a pair of sweatpants, two T-shirts, a sweatshirt, and other essentials. They also get their flight and duty assignments. And they are introduced to the basics of dorm life and drill procedures. The real training begins now, challenging the recruit mentally and physically. The members of the newly formed "flight," or unit, will learn how to report and salute. They'll be educated in entry control procedures, fitness and nutrition, drill, parts identification, human relations, and cultural sensitivity. They also will be issued their weapons and ID cards. Drill and physical conditioning begin in earnest this week and continue throughout the course. Air Force history is among the topics covered in week two. Career counseling is also made available. Educational and training topics include the warrior role, weapon handling and maintenance, suicide awareness and prevention, comprehensive airman’s fitness, basic leadership and character, basic situational awareness, and cyberawareness. Mental preparedness for combat is the focus of the week. Recruits learn the laws of armed conflict and anti-terrorism techniques. They also sit for one-on-one interviews with senior personnel. Combat training begins. 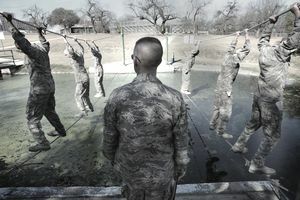 Recruits begin to learn defensive fighting techniques like tactical movement, cover and concealment, as well as advanced first aid. The emphasis is on self-defense and protecting other members of your unit. This is known as BEAST Week for more than one reason. It includes Basic Expeditionary Airman Skills Training (BEAST). And it's regarded as the toughest week of basic training. Recruits also undergo Combat Arms Training and Maintenance (CATM), and practice combatives and use of the pugil stick. Field Training Exercises (FTX) top off this highly stressful and physically-taxing week. This is primarily test week. Recruits undergo physical training evaluation and sit for written tests. There is more coursework, though, including instruction in combat stress recovery, computer training, career guidance, and personal financial management. Finally, it's Graduation Week. Friends and family are allowed to attend the formal ceremony at which you enter the United States Air Force. This is officially Airmen's Week. Having graduated from basic training, the new airmen prepare for the transition to technical training in their specializations and are placed in the appropriate squadrons. Although different training segments are introduced each week, the daily timeline stays pretty much the same. 0500 Prepare for physical conditioning. 0500-0600 Physical conditioning, which alternates between running and aerobic exercise. 0600-0615 You have 15 minutes to eat breakfast. 0630-0745 Put the dorm in shape and set up. The Air Force refers to quarters as dorms, not barracks. 0800-1130 Class time and drill time. 1300-1700 More classroom instruction or drills. 1900 Dorm setup for the night, including boot shining. 2100 Lights out when you hear "Taps."